What if you have no choice but to swim? Photo: Laura Bath. We have no choice. We simply can’t walk around the body of water in front of us. It’s deep and wide with no chance of us wading. We have looked at the body of water and deduced there is nothing actually in the water that can harm us. There is no outrageous flow, we have a safe and sensible entry and exit point, downstream is a safe runoff and we have discussed the crossing with members of our group. We have back up plans and everyone knows and is happy. We are all in agreement that we can safely cross. But how? Deep water crossings can potentially cause us huge problems. They often may not have the raw power of a fast moving river but if something does go wrong in the middle we are a long way from either bank and well out of our depth. Putting your feet down and having a quick rest is not a luxury we can afford. If we are interested in the outdoors and enjoy spending time out we simple must be able to swim. Whilst we could swim unaided we can make our crossing much easier by using a flotation device. Aside from the fact we would actually usually be carrying kit in a rucksack, a device of some sort will give us extra buoyancy and help keep a lot of our torso out of the water thus aiding with bodily heat retention. As with any water entry do it slowly. Remember the cold shock phase we talked about in previous articles. Entering cold water in any way is unpleasant but don’t rush this stage. Take several minutes even. 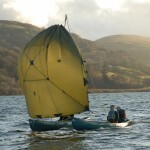 The ‘high tide’ mark on the body is particularly unpleasant but bear with it as it make the crossing much easier in the long run, as well as safer. When do you set off swimming don’t set off like Michael Phelps. Dependent on various factors (water temperature, air temperature, depth, width etc) we can become tired fairly quickly so unless you are an Olympic swimmer conserve your energy as well you can. Always remember that you simply cannot compare distances swum in a warm pool with distances swum outside in cold, moving water whilst wearing clothes. Ensure that your kit is properly secured before crossing. Little tips to aid with flotation include blowing a bit of air into a thermarest should you have one and the room to do so. Why not empty your water bottles to help with extra buoyancy too? As for what to wear I personally put boots in the bag and keep socks on. On my body I wear a pair of rugby shorts and some sort of thin lightweight layer on my torso to aid with heat retention. This fetching look is always topped off with a woolly hat. A rucksack, provided it is not loaded with lead weights, will always float due to Archimedes’ principle stating that ‘Any floating object displaces its own weight of fluid.’ We can therefore use our loaded pack to aid us across a body of water should we need to swim. 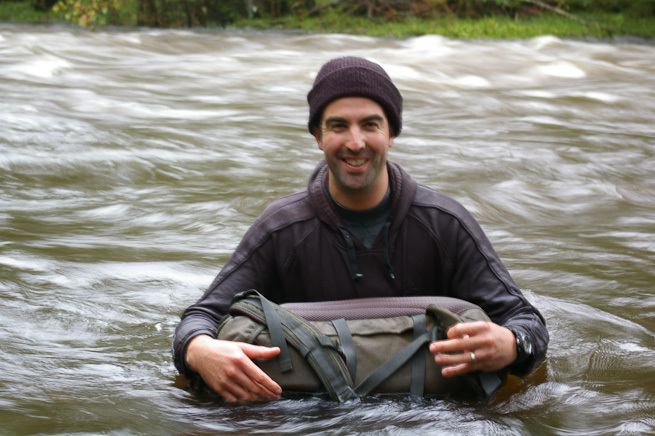 If crossing in a team people can either swim individually or actually rope their packs together creating a large raft. Remember, as always though, never to actually tie yourself to your pack or the raft. A normally packed rucksack will absorb and take on lots of water during a long crossing so bear this in mind when exiting and dragging a huge weight. You may find that towards the end of the crossing your pack (with added water weight) may be lower in the water but no need to worry. Not quite as realistic but I have seen it done, and used it as a training tool, is to use in place of a full pack, a partially filled dry bag. 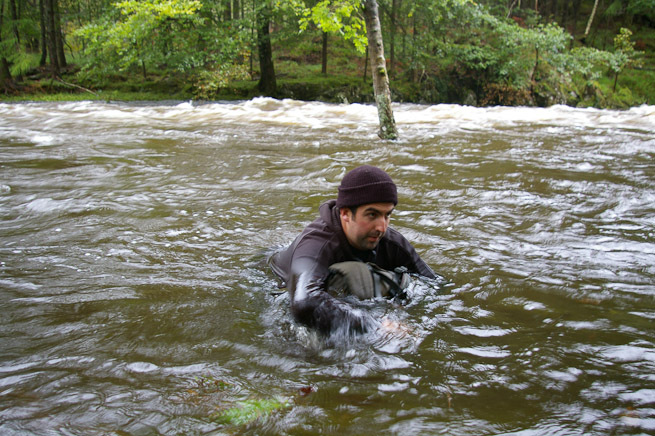 Bear in mind that some, if not most, dry bags are not designed to be submerged. 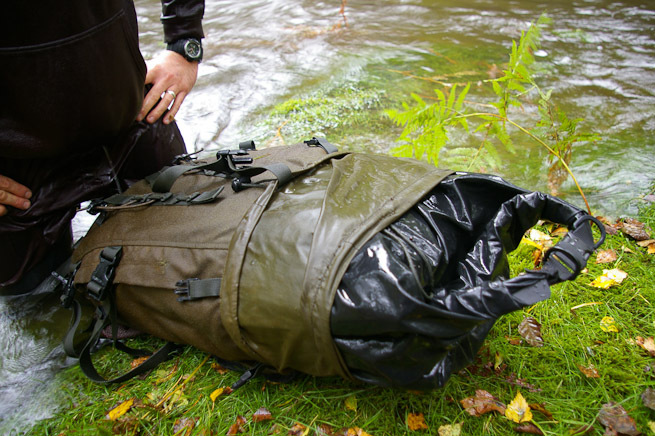 If using this as a training tool then you can simply put your spare clothes, boots and a towel into the dry bag to be used upon reaching the far side. In place of a dedicated dry bag (Ortileb provide a very good range) one can also use something like a rubble sack. Obviously this is more susceptible to damage – and obviously a dry bag being used as a float with a hole does not work all that well. Upon reaching the far bank of the river of lake, take extreme care when exiting the water as your legs may not be working as well as you may be used to having been exposed to the cold for a while. Having changed you will be much colder than you actually think. It is often worth resting and getting some warm food and drink into your system to help recovery. Even a small amount of time in cold water will have a fairly dramatic effect on your fatigue levels. This series of articles has been written in an attempt to warn people of the oft understated dangers of water in the outdoors. They are not aimed at warning people out of the outdoors. If we spend time outside we simply must be able to swim. If you don’t know how learn as soon as you can. Stay safe and enjoy the outdoors. Photo: Laura Bath. But the most important thing to remember is be safe always and enjoy your time outside. Disclaimer: The outdoors, and water hazards in particular, are inherently dangerous. 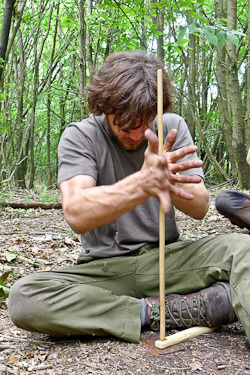 The author and Frontier Bushcraft Ltd disclaims any liability, personal or professional, resulting from the misapplication of any of the procedures described or depicted in this or following articles. Another excellent article. Its always very easy to over estimate ones ability in a situation like this. We may be good swimmers, and our outdoor knowledge may be good, but realising the potential for hidden hazards like water temperature, bodily heat loss, depth, distance (which always looks different from water level) entry and egress, and so on. even a low current can force extra distance to your swim before you realise it. And realising these hazards are not always at the forefront of the mind. This article has helped to highlight the necessity for planning and preperation for the crossing. Boots, clothing, floatation, recuperation etc. Well done and thanks to you James. This excellent article makes so much sense, with a profound but simple message at the end. PS That water looks freezing!